Principal habitats of the Sailfin Molly are edges of streams, ponds, canals, and swamps with heavy vegitation. Native range occurs along the Atlantic and Gulf Coast drainages from Cape Fear drainage, North Carolina, to Veracruz, Mexico. Restricted to coastal areas in most of range; found farther inland in Florida, Louisiana, and Texas. Sailfin Mollys are omnivorous and requires both meaty foods as well as algae. Provide these fish with an algae-based flake food, as well as freeze-dried bloodworms, tubifex, and brine shrimp. 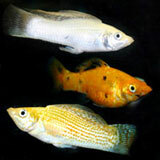 Gouramis, other livebearers, peaceful cichlids, Corydoras. Sometimes they will attempt to chase others around a bit, but do not hurt them in most instances. Mollies do best in a group with a few males and several females. Mollies are good tank mates for Swordtails, Platies, Angel Fish, Corydoras, Plecostomus, and bigger Tetras such as Black Tetra, Red Serpaes, and Silver Tips. Sailfins benefit from the addition of some salt, which will not harm most other community fishes. Must have lots of open swimming room or the male’s sailfin will not develop fully.